I’m not gonna lie, I love the convenience of a slow cooker. I have two different sizes of slow cookers and they’re busy cooking something all of the time here. Sometimes both slow cookers at the same time! But what’s not to love? I mean, you combine ingredients the night before or even in the morning, set the crock in its base, turn it on and supper cooks while you’re not even there. Now that’s the kind of laziness convenience that speaks to me! One of my favorite main dishes to cook in my slow cooker is a spicy sticky chicken. I have no idea where the name comes from, but stay with me now – you’re gonna LOVE THIS! Our oldest daughter who owns the Real Food Enthusiast shared this recipe with me several years ago. She commented “I know how y’all like spicy food and this has some great seasonings like cayenne pepper and paprika”. And boy oh boy was she ever right! These days this is our favorite way to enjoy inexpensive whole chicken. Add to that the convenience of throwing the ingredients in the slow cooker in the morning and leaving for work, then walking into the house tired & hungry that evening to the delightful aroma of supper already prepared & ready? Well now that’s a winner, folks! First I pull out the chicken, rinse it off and set it aside to allow the water to drain off. While the chicken is drying I combine my spices in a bowl – paprika, cayenne pepper, cracked black pepper, chili powder, garlic powder, onion powder, thyme, and salt. Now that my spice mix is prepared I’m ready to deal with that chicken. I trim off excess fat & skin. But I’m careful to place the trimmings into a bowl in the fridge for use later. I’ll explain why later. 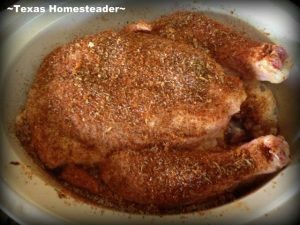 Next I rub my mixed spices over the entire surface of the chicken both inside and out, reserving just a little to sprinkle on top of the chicken after it’s placed in the slow cooker crock. (It makes the meat look nice when it’s prepared.) Now my mama always taught me “Presentation is half the meal” and she’s right. I’ve always used that theory in my kitchen and I’ve taught it to our children as well. Aaaanyway, after the chicken is fully seasoned I quarter an onion and place it inside the chicken. Now I’ll admit sometimes I add the onion and sometimes I skip this step altogether because (say it with me now) “Flexibility is key in the Taylor kitchen!“ The chicken turns out beautifully either way. So if you don’t have an onion handy don’t let that stop you from trying this recipe. OK now that my chicken is prepared for cooking I place it into my slow cooker and sprinkle my reserved seasonings on top. There’s no need to add any liquid, the chicken will make it’s own broth as it cooks. And y’all, listen carefully: You’re gonna want to save that savory liquid to give you a jump-start to making your own chicken broth with the chicken trimmings you saved in the fridge as well as the skin & bones. That’s right, even after this chicken has done hard duty feeding your family it still has even more to give and you certainly don’t want to miss out! Now, turn that slow cooker on low and step out to tackle the world. That chicken will be slowly cooking to perfection while you’re away. When you drag yourself back home after a hard day at work, remove your Wonder Woman cape and arrive back in your kitchen you’ll be so glad you planned ahead this morning. The aroma of perfectly seasoned chicken will cause you to go into a trance. Dinner is a snap now! No need to gather up the kids and drive to the local fast-food place to plunk down your hard-earned money on a substandard meal. You’re looking at real home-cooked goodness right in front of you. Add a couple of sides or maybe a nice salad and you’re all set. Yeah, that Wonder Woman cape isn’t hanging in the hall for nothin’ sistah… PLUS there are six (yes count ’em – S-I-X) ways I’m able to use this one chicken! See how I fully utilize this one bird in six different ways. 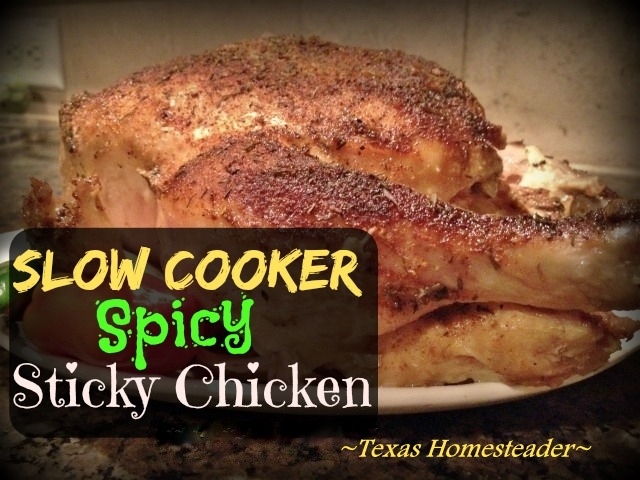 Easy slow-cooker chicken recipe with spicy seasonings like cayenne pepper and paprika. This is our favorite way to enjoy inexpensive whole chicken! Remove chicken from packaging, rinse bird and set aside to allow water to drain. In the meantime in a bowl mix the spices. Rub chicken skin generously inside & out with seasonings, reserving a small amount to sprinkle on top later. Insert quartered onion into chicken cavity and place chicken in slow cooker. Sprinkle top of bird with remaining seasoning. Cook on low 8-10 hours or until meat thermometer placed into the thigh section (but not touching bone) reaches 165 degrees. Remove chicken from slow cooker and allow it to rest for about 5 minutes. Then carve & enjoy. Want to see other Meal Ideas? 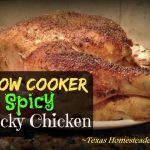 This entry was posted in Blog Posts and tagged Cooking, Recipes on May 24, 2015 by Texas Homesteader. This sounds delicious! I really need to start using my slow cooker more often and this recipe gives me a good excuse! Thanks so much for sharing it with us at Share The Wealth Sunday! Looks like a great recipe. Thank you for sharing with us at #HomeMattersParty .We would love to have you again next week. Pingback: 1 Chicken, 6 Ways - Using It ALL! My grandson, age 6, looked at the picture of the spices and saw a pig! Can you see it? The recipe sounds wonderful. I will probably try it. Pingback: Homemade Chicken Pot Pie... From SCRATCH! We go to Sam,s about 4 times a year since we also live a 110 mile roundtrip from it.Tomorrow is our planned trip.Since I have a whole chicken in the freezer I have time to let it thaw over night and do your recipie before we leave.It will drive the dogs crazy when they smell it cooking,but oh it will be so nice to come home to it.Thank you. I love my slow cooker too! Thanks for sharing on My 2 Favorite Things on Thursday!! Hope to see you tomorrow! Pinned! I make something similar but always bake it in the oven. I think I’ll have to try it in the slow cooker to make my life much easier! Thanks for sharing at Merry Monday! I’ve never made an entire chicken in the slow cooker, but this will be great to try during the summer since I hate turning on the oven. Will try this. I need to join this group- I love my slow cooker too. I work from home but it is still great to throw something in in the morning and – wa la a meal at 5pm. What is not to like !!! Thanks for sharing – we would like this. Visiting from Pretty Pintastic. This sounds great but I need to tone down hot/peppery seasonings when I cook. Would this be too bland if I reduced the cayenne and pepper? Thanks! Crockpot chicken is now the only way I will cook a whole chicken. I love that when it’s cool, I can get every single bit of meat off the bones with no effort!